Two bags of Jelly Belly jelly beans. Mmm Good. 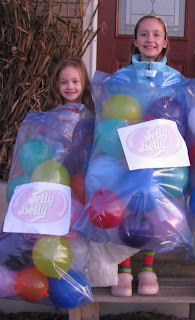 The girls created these by using Giant ziploc bags filled with bright balloons. We printed off the Jelly Belly logo from the website and used giant safety pins to attach to their winter coats. They were ready to Trick or Treat and stay warm.